2014 was less than a banner year for Minnesota sports. The Twins completed their fourth losing season in a row after being one of the best in the AL central for the previous decade. The Vikings were coming off a losing season and heading into another year of mediocrity and quarterback woes. The Wild snagged a wildcard spot, and even beat the second seeded Avalanche, but inevitably fizzled out against the Blackhawks for the second year in a row. And the worst of the bunch, my beloved Timberwolves, despite the promise of our young talent and a stellar year from Kevin Love (averaging 26 points and 12.5 rebounds), missed the playoffs for the 9th straight season. They ended up trading Love for Andrew Wiggins that summer, again rebuilding their own rebuilding process, and we fans knew another year of 40+ losses was ahead of us. (Fast forward to the present and the Wolves are at 12 straight playoff-less years. Here’s hoping Towns and Thibodeau can change that soon). I am from Minneapolis and studied business at North Dakota State University in Fargo. The distance between me and the Twin Cities never stopped me from following my favorite teams, but it was rare that I got to see them live as I often was able to growing up (I’m reminded of watching Kevin Garnett and Allen Iverson square off against each other in the 2001 season opener, following Iverson’s historic MVP season). However this was the first time in a handful of years that I was able to see the Timberwolves live on more than one occasion. And as I mentioned 2014 being yet another miserable year for Minnesota sports, these two games I witnessed (or rather had to endure like Cersei Lannister’s walk from the Sept to the Red Keep) were the absolute manifestations of mediocrity and everything I expect when expecting the worst from Minnesota sports. The following accounts of these two “professional” sporting events I witnessed, despite scores, statistics, and probabilities, are unfortunately 100% accurate. 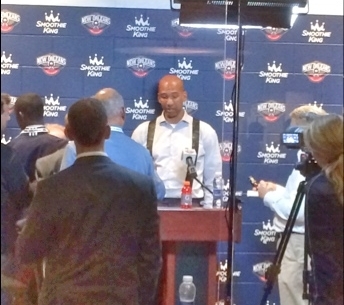 The first atrocity took place on November 14, 2014 at the Smoothie King Center. One of my best friends, former teammates, and long time NBA fan, Jackson (brother-in-law of The Rambling Fan’s founder, Joel Wilson) used to work in the front office of both the New Orleans Pelicans and Saints. 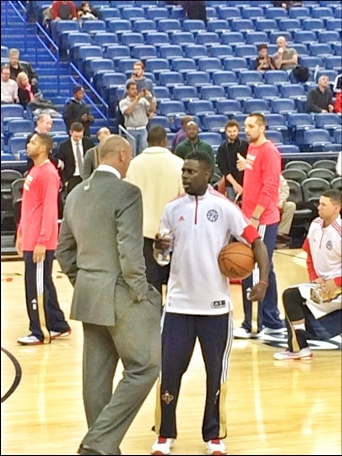 Once the Timberwolves schedule was announced in the summer of 2014, I couldn’t help but notice the Wolves had a game against the Pelicans on a Friday night in NOLA. Another good friend of mine, Noah, and I decided this would be a perfect opportunity to visit Jackson and watch our favorite team play in an arena we had never been to. We flew down Friday morning, got settled into our lodgings for the weekend, and walked down the famous St. Charles Avenue to take in some delicious Cajun cooking at a tavern of the same name (If you’re ever down in New Orleans, I highly recommend St. Charles Tavern for some delicious Cajun style breakfast). As we waited for Jackson to pick us up and take us to the game, we were giddy with anticipation. The number one overall pick, our new rookie, Andrew Wiggins, aka Maple Jordan, aka The Canadian LeBron, was on the Wolves, and was going to be our Moses leading us into the Promised Land. We get to the arena and see that our tickets are eight rows behind the Wolves bench. We get to see our young guys up close, and hear them interact on the bench throughout the game. We each grabbed a smoothie before tipoff (soon realizing we should have grabbed a few beers instead) and the crap-fest began. The Pelicans quickly went on an 18-3 run in the first quarter and didn’t let up from there. They outscored our dysfunctional young team 43-19 in the first, and 37-25 in the second, boasting a 36 point lead at the half (for those counting at home that’s 80 first half points). When it was all said and done, we didn’t hear a single cheer from the bench, and the only audible “banter” we heard from the team was Shabazz Muhammad cussing everyone out on the floor. The final score was 139-91, which is the biggest blowout loss in Timberwolves history. After a one and a half year hiatus from seeing a Wolves game live, this was an off-putting experience to say the least. But I didn’t let that stop me from seeing the Timberwolves put forth another terrible effort on my birthday…..
December 3rd, 2014 marked my 23rd birthday, and a Timberwolves home game against the 76ers. My good friend and former roommate, Tyler (originally from Philly) and I had agreed to make it to a Wolves-Sixers game the next time they were playing at the Target Center. Once we noticed it was going to be on my birthday, we marked it as a can’t miss – especially with offers of Tyler and his brother paying for my tickets, food, and beer. (Shoutout to the Smith brothers). I drove the 3.5 hours down to the Twin Cities after my morning classes on a Wednesday, and met up with Tyler and his brother for pizza and beer before what I would argue was a worse performance than the aforementioned blowout loss in New Orleans. Keep in mind that at this time the 76ers and Sam Hinkie were in full “trust the process” mode, tanking season after season for draft picks and prospects, while acquiring seemingly infinite assets. They had started the 2014-15 season 0-17, tying the NBA record for second most losses to start a season in NBA history. The Timberwolves certainly weren’t poised to make the playoffs by any means, and were doing a tank-job of their own, but they weren’t quite as honest about it as the Sixers’ infamous GM was. Because of this, I knew this game was going to be a nightmare. And sure enough by the time they tipped off, we were Freddy Krueger deep in the nightmare. The East-West “Tank for Towns” showdown started with both teams facing the wrong baskets and they had to redo the jump ball, a faux pas most fan bases usually don’t see past the third grade level of the game, but not for us Timberwolves and 76ers fans. The following 48 minutes of basketball were harder to watch than Batman v Superman. The Sixers notched their first win of the year with an 85-77 grind of a win on the Wolves’ home court. The Sixers shot a brutal 39% from the field, and 21% from three as opposed to the Timberwolves abysmal 35.7% from the field and 17.6% from three. Trust me when I say I learned my lesson at the Smoothie King Center, and the beers were flowing during the worst piece of professional sports I have ever witnessed in person. I will ride with the Timberwolves until I die, and we haven’t had as much promise as we do right now since we saw Garnett reach his prime, but I strongly believe Towns can bring us to glory. And oh how much sweeter will every win taste after experiencing first hand two of the most brutal Timberwolves performances in this young franchise’s history. I want to thank Joel Wilson for giving me this opportunity to contribute to The Rambling Fan. I hope you all enjoyed the piece and I hope to be able to contribute again in the not too distant future!